20 minutes from the center of Marrakech, discover in a luxurious setting, the authentic and refined architecture of Villa Dar Moudar. offered exclusively. Villa Dar Moudar contains 5 prestigious suites and lounges both traditional and modern. The riad is located in the heart of a garden of one hectare with a very large pool. Ideal for a relaxing stay with family, the Dar Moudar villa offers a privileged view of the Atlas mountains. Come enjoy a customized service to seduce you during your stay. We had mixed feelings about our Stay in Villa Dar Moudar. The pool is better than the pictures make out and is really nice as is the downstairs living rooms. There were 4 bedrooms upstairs which came with en-suites. The fifth bedroom is downstairs and not displayed in any of the pics and when you see it you will understand why. Anyone in this room will have the short straw. WIFI only worked intermittently and was only plugged in Friday & Saturday. We had no Wi-Fi on Thursday or Sunday can only assume the owners paid for 2 days as it is via a dongle. When asked they would message saying it would be back on in an hour and we would just go around in circles like that. We also paid for breakfast during our stay which was 6 euros per person per day. We were told this would be a big breakfast with lots of Fruit, eggs beans the works. For 8 people we got a few Moroccan pancakes with some jam and 2 eggs( No joke). Second day we ended up going to a cash and carry to get some more food to subsidise. Next issue was trying to order a taxi. This is what wound me up the most. They said they could order us a taxi but we would have to give the money to Razor (Security Guard) for the taxi not the taxi driver. We reluctantly agreed the first day as we had no Wifi and was unable to order one for ourselves. Once we arrived in Marrakesh i found out that they had taken 50% mark-up for making a call for a taxi. Luckily we met a driver while quad biking and he picked us up and dropped us off as we needed, cutting out the owners of the Villa. Taking all this into account I would not recommend nor stay at this Villa again as the owners caused us stress from the outset. We felt they took advantage wherever possible to make more money out of us. If you do stay at this Villa bear all this in mind plus it is also a good 45 mins into the main bit of Marrakesh and a taxi one way will cost you around 25 Euros. Also nothing is provided in the Villa not even toilet paper and there are no shops within walking distance. Easy directions via google maps and sign posted from the main road to the villa. Around 25-30 minutes from Marrakesh centre. Soon as you arrive at the main entrance it is like a dream. 10000 square meter place of a top class private villa & swimming pool. Soon as you walk in you feel the relaxing environment and calmness away from the busy life. The villa downstairs has 3 living rooms areas with AC's, a toilet/sink and a large kitchen with full amenities including dishwasher, oven, iron, utensils and large fridge/freezer with water dispenser & ice cube maker. The spacious garden has an amazing swimming pool (20 Mtrs x 6/7 Mtrs and goes 2 Mtrs deep), sunbeds, large purpose built canopy with bbq area, outdoor shower area with wc's, a table tennis table and a football goal. Nice scenery and very private. Upstairs has a beautiful stairway/hall way and 4 well decorated bedrooms with AC's and ensuite bathrooms. Towels and robes are provided and a chef/cleaner are available for a minimal fee. Friendly owner & staff. I would 100% come again and recommend to all, friends and family. Thank you for an amazing comfortable family holiday. you were lovely and I would welcome you to our villa several times. Scarred me for life. The landlady wanted to hit my friend with a stick. She switched for the A.C for the last tonight because 'we were wasting electricity'. There were ants EVERYWHERE including the kitchen. WiFi was basically useless. She brought her son to initimidate us. She called us a monkey. Belle demeure et services dignes d'un grand hotel. Un séjour inoubliable, la maison permet de loger facilement 10 personnes sans se gêner les uns les autres . Dar moudar est décorée avec beaucoup de goût "digne d'un palais des mille et une nuit ". La maison dispose d'une très grande piscine et belle piscine qui a fait la joie des grands et des petits. Merci à. Zohra Moudar qui a à cœur le confort et le bien être de ses hôtes ( c'est réussi nous nous sentions comme à la maison ). Un grand merci à Reda qui s'occupe de l'intendance de la maison pour sa disponibilité et sa discrétion. Un grand merci à Khadija pour sa gentillesse et ses merveilleux petits plats. Nous gardons cette adresse pour nos prochain séjour . Super séjour ! Que du bonheur et de la gentillesse : un havre de paix ! Accueil et gentillesse : tout est fait pour les hôtes ! Parfait ! Sublime villa, vacances parfaites. Tout le monde était aux petits soins pour nous et nos amis, Zohra la propriétaire comme tout le reste du personnel. Chambres spacieuses, piscine inoubliable et surtout deux salons immenses pour en profiter tous les jours ! Merci encore pour l'accueil. A bientôt avec grand plaisir ! 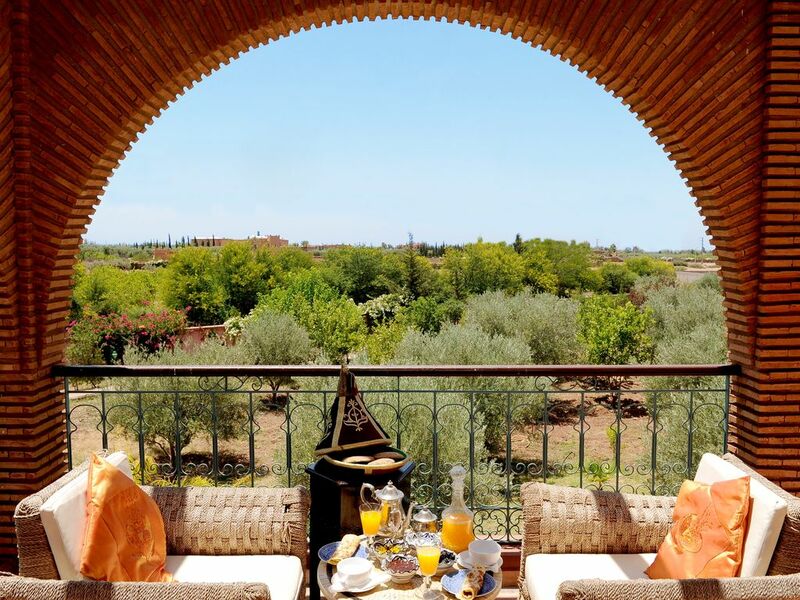 The villa Dar Moudar enjoys a geographical location making it accessible in 20 minutes from the center of Marrakech.